Higher Steaks is one of the new players on the rapidly growing clean meat market. 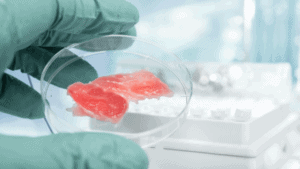 Using state-of-the-art cell culture techniques, they create meat in a sustainable way, without killing any animals in the progress. Said to taste exactly the same as traditional meat, cell-based meat has the potential to use 99% less land, 96% less water, 45% less energy and has up to 96% less greenhouse gas emissions. Why should the world turn to clean meat? The world’s population is expanding at an exponential rate and meat consumption is increasing by over 2% yearly, despite growing knowledge of its negative public health, environmental and animal welfare impacts. The most common sources of foodborne disease, which kill 420,000 people each year, are meats. Antibiotic resistant pathogens are predicted to kill more people than cancer in 2050, and their mass use within agricultural animals is known to be one of the largest contributors to this. Traditional industrial meat production is also a resource intensive process, demanding approximately a third of ice-free terrestrial land and fresh water. It is responsible for approximately 15% of all GHG emissions, more than the whole transport industry. To ensure world-wide sustainable development and health goals are met by 2050, we must create a more efficient and sustainable food supply. Cell-based meat is the only solution with the potential to produce meat products indistinguishable to traditional meat products offered today. Please describe what products you will bring to market. We will be starting with pork sausage and mince. On the long term, we believe that the real value of the cell-based meat industry in comparison to other alternatives lies in more complex products such as chicken breasts, pork chops or steaks and will therefore move towards those. What is the USP of your product – what differentiates your products from other clean meat manufacturers? As of now most of our USPs are in the technologies we are using, which focus on the key manufacturing challenges including developing a production method that substantially reduces the amount of media needed to produce cell-based meat to reduce the cost of production, an intelligent in-process monitoring system to improve efficiency and a biomaterial that will allow us to generate more structurally complex products. This will help us bring a product with lower cost at higher quality. As we evolve, we aim to develop key additional advantages around the product’s taste. Could you please say a little about the cellular process involved on creating your products? We are working with cells called induced pluripotent stem cells. This means that we can get the cells from a non-invasive method such as a blood sample or a small sample of skin. The cells are then reprogrammed into induced pluripotent stem cells, which today can be done without the need to modify the genome. The cells are then first proliferated and then differentiated into either skeletal muscle or fat. In which countries will your products be available? We will be starting with Europe but plan to very quickly expand globally. Do you have a company mission / what are you aiming for as a company? Our aim is to produce a complete technology solution making the commercial manufacture of cell-based meat a reality. We’re working towards a world where people can continue to enjoy consuming meat while limiting damage to animals, the earth and our health. Who is your target consumer group? Our main target group are people who currently eat meat, are looking to reduce their consumption but find it too difficult with available products. When and where will your products be available? We are aiming to be on the market in 2021.